C.H. Fisher, Dresden; J. M. Heberle, Cologne, 24 October 1906, lot 549 (the milk-jug). The Conrad Collection, San Francisco (the milk-jug). Mrs. Robert Nicholls (the milk-jug). With J. Polar Antiques, San Francisco, 1989 (the teabowl). For a slightly larger turquoise-ground jug of similar form with variant decoration previously in the collections of Baroness Renée de Becker and Mr. and Mrs. Deane Johnson, see Sotheby Parke Bernet, Inc., New York, 9 December 1972, lot 39. The teapot, waste-bowl and a cup and saucer from the service to which the present teabowl belongs is in the collection of Mrs. C.B. (Bessie) Stout, Dixon Gallery and Gardens, Memphis, Tennessee. 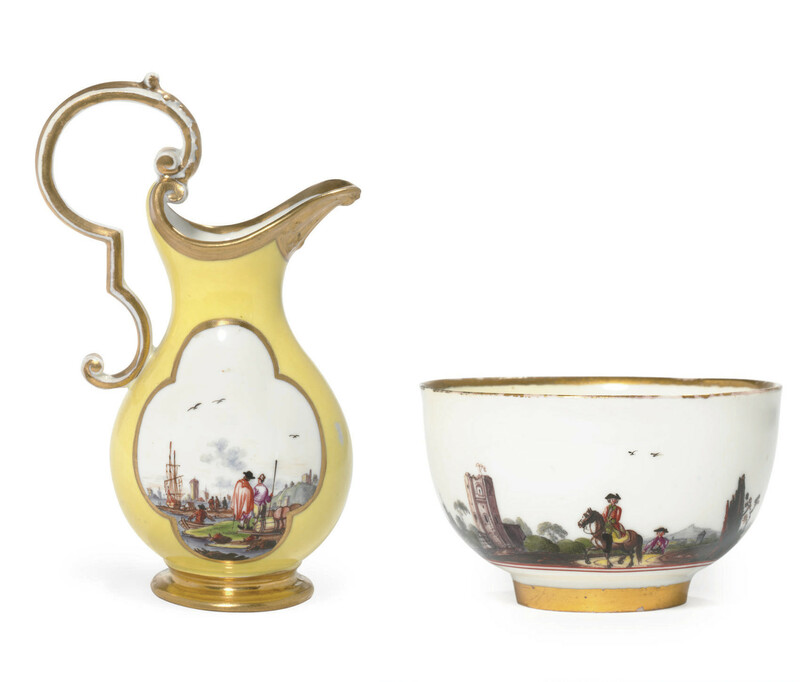 See The Wark Collection of Early Meissen Porcelain, Cummer Museum of Art, Jacksonville, Florida, 1984, p. 147, nos. 221-224 for similarly decorated wares, the painting attributed to Heintze.